Decades ago, the “Just-In-Time” (JIT) production methodology transformed the global economy by combining new capabilities to reduce production time, improve quality, and drive down costs. We now find ourselves at the beginning of another such shift with similar dynamics and opportunities that will transform the workplace and deliver quantum improvements to quality, retention, and firm profitability. Bâton Global leverages boundary-less and virtual organizational strategies to unlock value for clients. How can emergent capabilities in the workforce environment be put to work for you? JIT production took advantage of several different emerging trends to create a process that was not strictly possible before. It is this revolutionary approach that was able to unlock new areas of value across production value chains. Suppliers, with increased agency and clarity, were able to produce more appropriate inputs that allowed for downstream optimization. Logistics capabilities grew to overcome not just distance more swiftly, but also to reduce the effects of barriers to trade to improve timing and reliability. These reinforcing improvements enabled the Production function to operate much more efficiently, leading to higher quality, lower costs, and improved responsiveness. 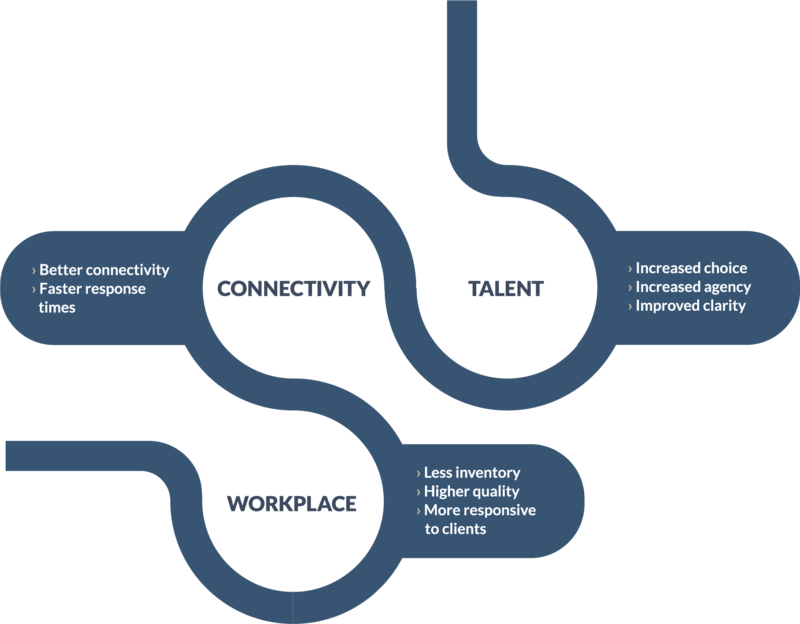 The same type of shift in capabilities is happening today with regards to how human capital can be acquired, connected, and deployed within your firm. Demographic and generational shifts are creating large pools of talent that can be leveraged differently than traditional on-site staff. Connectivity has improved dramatically in areas that are obvious (such as bandwidth) as well as in areas that are less obvious, but more transformative. For instance, collaboration tools such as Slack and Basecamp allow for greater collaboration regardless of staff location. With the right management processes in place, these trends can be brought to bear upon the workplace in very much the same way that JIT was able to be implemented in factories around the world. Done properly, they can also deliver the same scale of improvements to your firm. As with JIT, the incredible benefits of the new process require that two dynamic processes be in place. Firstly, there are sufficient technological and demographic changes to allow and reinforce new ways of doing business. From your firm’s perspective, this is the easiest process to adopt as it only requires recognition of the shifts in the external environment already underway. The second is much more challenging – a reinvention of process and practice to truly embrace and leverage these shifts and the benefits they can bring.